“Deep in the black mountains, deep in the Romanian night, deep beneath the cold, dark waters of the ancient Olt, the river witches sang. Serafina is due to become the queen of the underwater kingdom in which she lives. However scared she is of this nothing prepares her for the day of her declaration when there is an attack on her city. Her kingdom is under siege and she has to flee. She finds herself running from people all around her, people she thought could be trusted but who it turns out cannot be. The only route to take is to the River Witches, following dreams of talismans and other powerful merls who are just like her. She finds herself fleeing to beings she always believed were myth. Can this myth save her and her kingdom, or are they yet another clan to avoid? I have a real issue with the mermaid genre and to be honest, I have no idea why that is. I know that the only reason I even picked this book up is because Jennifer Donnelly is one of my all time favourite YA authors, and she has delivered once more with a beautifully written book. The story was a really great start to a series type story. The book as a whole is a decent length for a story with not as much action or as much background needing to be drawn in but because of the Waterfire Saga’s background Deep Blue only really covers the very beginning. I think if the books as aimed at a slightly older audience that it could have been lengthen significantly and it would have delivered more of an impact, however I am intrigued by the beginning of the sage and I will carry it on. The writing as I said above is beautiful, you really get the feel for life under the sea and all that background mentioned is put across very coherently. I really enjoyed the character development at the beginning of the book and the action packs scenes that come later and think Jennifer Donnelly did a brilliant job of these. As far as I’m concerned Deep Blue was a fantastic book that brought me a genre I usually defer from reading and made me enjoy it, to a certain extent. There are things I didn’t like about it and thats partly to do with the feeling that it was toned down, from what I expected, slightly so that its almost reading like a Middle Grade. Serafina seemed a little immature some of the time and considering Neela was so into fashion and broke the rules making dresses when she wasn’t meant to she came across as a bit of a pushover towards the end of the book, I thought she had more guts than that! I am looking forward to the rest of the series and will probably continue it when they come out, however I do wish that this was aimed more at the higher end of YA so it could have been longer and had more going on, I felt like the story only really got going towards the end of the book and then it had to come to an abrupt end. I do recommend it for younger fantasy readers though and think it would be a great addition to any 10 or 11 year olds shelf who want to get into the world of fantasy. 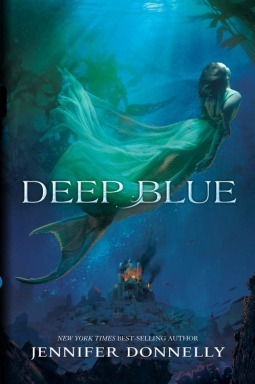 Deep Blue is the first book in the Waterfire Saga and was published by Hodder Children’s books on May 1st. My copy was sent from the publisher in exchange for an honest review.